Lloyd Marcus -- It's all about Obama...Mm...Mm..Mm! My wife Mary's eyes glaze over whenever I mention football. "But honey this is about life not football" I promise her. She graciously listens. Three years ago with only a few minutes left in the game, all Tony Romo, quarterback of the Dallas Cowboys had to do was hold the football so his kicker could kick a game tying field goal. Romo fumbled the ball. After his horrible unbelievable mistake, the young quarterback sat on the bench dejected with his head hung low. John Madden, former pro football coach was one of the announcers on the TV broadcast team. Madden said, "Somebody needs to tell Romo to get his head up. This game is not over and he still has to lead his team." Wow, I don't know why, but I found the wise old coach instructing (mentoring) the young man quite moving. Madden was saying leadership is understanding it is not about you. As the Bible says, "To whom much is given, much is required." Madden is also saying, OK, Tony Romo, you said you wanted to be the leader of this team; you must do just that, Lead! You do not have the luxury of sulking over your mistakes. True leadership is putting the needs of your team before your needs. The Obama administration and the media puts his needs before the best interest of the American people. They believe since Obama is the first black president, he is simply too big to fail. Consequently, every event, policy and etc is judged from a "how will this affect Obama's presidency" point of view rather than what is best for America. They protect him at all cost against all offenders. 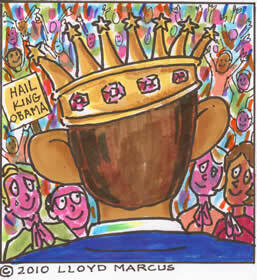 Rush Limbaugh was verbally gang flogged for daring to say he hoped Obama's wacko agenda failed? Think about this folks. We have a president that everything is about him. Despite it being the best facility to house enemy combatants, Obama has vowed to close Guantanamo Bay prison to appease far left voters. It's all about what is best for Obama. Months ago, Obama called the Cambridge cops stupid for arresting Gates. Black professor Gates was wrong. The white decorated arresting officer was right. Still, the Obama administration and liberal media immediately went into "defend Obama mode." They launched a national champaign on talk shows, print and etc attempting to prove Obama correct; all police are racist profilers who abuse blacks. Can you imagine the lengths Obama and his minions will go to make him look good. Throw national relations between blacks and the police under the bus, no problem. It's all about Obama. Most outrageously, along with 9-11 terrorists, the failed underwear bomber will be given the same legal rights as an American citizen, free lawyer and etc. Why? To pander to Obama's far left America hating radical voters. Trying terrorists in civilian court will give them access to our intelligence and a worldwide platform to spew their anti-American rhetoric, thus putting American lives at risk. No problem because it is not about us, it's all about Obama. He has to throw his voters who think we deserved 9-11 a big bone. After three terrorists attacks in the last six months, many predict another attack will put our president in deep trouble with the American people. That might be the truth regarding a normal presidency. But, you just don't get it. The media will simply circle the wagons around their golden child. Obama's black skin is the ultimate trump card exempting him of any criticism and objective critique. Obama-ites in the media and democrats call the millions of Tea Party Patriots who are against Obama's, "Fundamental restructuring of America" an angry mob of rednecks and racists. Ignoring the presence of highly visible blacks such as myself and others (I wrote the national Tea Party Anthem for crying out loud) lib commentator Chris Matthews boldly proclaimed, "There are no blacks at the tea parties. They're all white!" Again, trashing whites and straining race relations in America to further Obama's agenda, no problem. It's all about Obama. Obama was caught on video eight times during his campaign promising health care negotiations would be broadcast on C-span. Now in the White House, Obama has rejected C-span's request to broadcast the health care negotiations. Obama's lie will only be reported on a few cable networks and the web. The majority of the mainstream media will protect Obama. Remember, when the story broke about elementary school kids being taught songs praising Obama? The real message in the songs is, "It's all about Obama...Mm...Mm..Mm!" I could go on and on giving examples of how the media judges every political event as how it will affect the presidency of their sacred black president with no regard for America's best interest. Here is another quick example. After his heart attack scare, Rush Limbaugh said the health care he received was excellent. Rush said the American health care system is the best in the world. The media was outraged and called Rush's proclamation an attack against Obama. Apparently, praising our health care system is unacceptable and bordering on "hate speech" when it does not line up with Obama's agenda. Everything is about Obama. Mr. Obama is the man who occupies the Oval office, but he is not our leader. He has yet to grasp the concept that it is not about him. By the way, quarterback Tony Romo did get his head up. He has lead his team to numerous victories. Today, Tony Romo is a pro football superstar. The Obama administration and the media puts his needs before the best interest of the American people. They believe since Obama is the first black president, he is simply too big to fail.